For some, business and environmental sustainability don’t come together. However, there are companies who managed to rise above the rest by engaging in eco-friendly techniques that protect not only their investment but as well as the environment. One of them is Packaging Environmental, an eco-friendly packaging company owned and managed by Indrajit Shah. Packaging Environmental Limited is a UK based company that primarily offers eco packaging for food and drinks. Established in 2007, the company has now earned the reputation as a leading supplier of biodegradable, compostable and recycled packaging materials that don’t compromise design, quality, and cost-effectiveness. 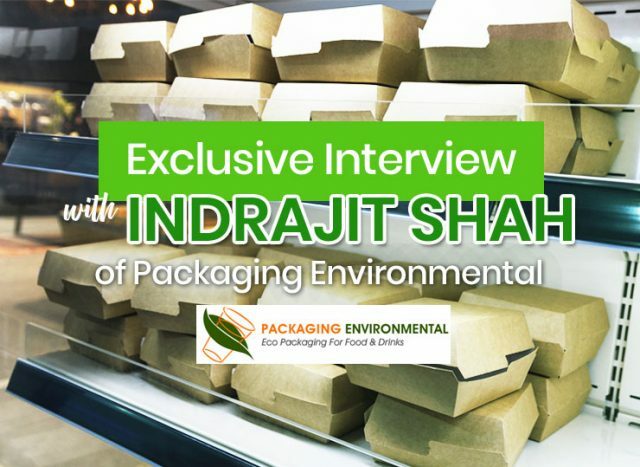 As the leading eco-friendly courier service in the UK, Green Courier features Indrajit Shah of Packaging Environmental in an interview, to give you an insight on the added efforts that environment-friendly companies exert in support of sustainability. 1. Packaging Environmental is one of the many businesses that have already incorporated eco-friendly initiatives. Can you give us a brief background about the company? Is there a particular situation that propelled you to be in this industry? Right from the very beginning of our company, our mission was to provide sustainable packaging solutions – it is not something we incorporated over time. Myself and the other company founders have always had a strong interest in sustainability, sustainable development, and other environmental issues – we were looking to start a business in this sector and packaging seemed like a great opportunity. 2. As a producer of biodegradable and recycled food packaging, it is evident that you are an environmental advocate. How do you see Packaging Environmental in the next 5 years? We want to expand in Europe and globally so we at least double the size of our business. We also want to expand our range so that we have a clear and consistent range of products with a clear brand and environmental message. 3. Breaking away from the norms to protect the environment is a huge step to take. In your opinion, what is the biggest challenge that business owners like you are facing? Lack of help from the government – their policies hinder entrepreneurship and innovation. If I had an opportunity to start the same business today I would not do it as there is very little benefit to starting a business given the enormous risk and hard work it involved. 4. With a lot of packaging brands claiming to be eco-friendly, what is it about Packaging Environmental that makes it standout as a leading supplier in the UK? The quality of our products and our service. It is second to none and we have a knowledgeable team that will be able to inform you in details about the products you need. 5. Do you have plans of expanding your business? Would you like to explore other eco-friendly packaging options aside from food and beverages? We do not have plans to venture outside of food packaging at the moment. 6. As an expert, what would you consider as the biggest trends that became game changers in terms of preserving our planet? I would say this year there was a collective worldwide movement by people from all over the world about how the waste we are creating that simply is not viable for our planet. It was inspiring to see. This has led to us going full circle in a way to doing thing that our parents and grandparents generation used to do – using paper straws or not straws, trying to stop single use products as much as possible. 7. There are still people who don’t support eco-friendly initiatives mainly because of the added cost associated with them. If you are to convince them about using environment-friendly products, what are the cost-effective benefits that you’d want to point out? In reality, there are no cost benefits – it does cost more. Though what we have seen is businesses will to change their packaging and who have communicated this to their customers have seem a direct impact and uplift in their sales and customer loyalty. Also the cost in the long term to them and the planet would be a lot more. 8. How do you envision the future trends in food packaging? It is an exciting time at the moment…the entry of food delivery brands such as deliveroo and undereats has really shaken up the market. So food businesses that never needed packaging now all need packaging which needs to keep food warm and intact but at the same time needs to be recyclable or biodegradable. It is our job to come up with these solutions. 9. Aside from patronizing your biodegradable food packaging products, can you share with our readers some tips on how they can do their part in protecting the planet? Start off with the basics and also ask a lot of questions. By ‘basics’ I mean recycle as much as possible at home, get involved with local recycling initiatives, grow your own food, look at your energy consumption and how you can reduce this and change to a better energy supplier. Look at your consumption of animal based products and aim to reduce this too. If every makes small steps in all of these things it can make a massive impact. 10. Are there new products from Packaging Environmental that we should look forward to in the coming months? We will be introducing a range of fully recyclable hot food containers and also an innovative burger wrap made from recycled paper. We will also developing a range of reusable packaging from coffee cups to food containers to straws which will also be made from sustainable materials. A lot of businesses are now taking the steps to sustainability and among these are Green Courier and Packaging Environmental–two companies who found strategies to grow their businesses without harming the environment. Is there an eco-friendly advocate that you want us to feature in our blog? Let us know by leaving a comment below.